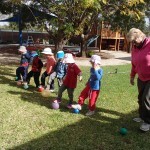 Today at Pop-up Play we had a group of Prep-3 students from the school and the Sea Lake Pre School children. So we had lots of new people to play with. 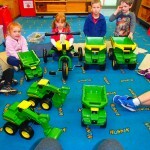 We talked about strategies for making new friends like: Asking them their names, telling them our names and asking if they wanted to play with us. 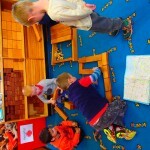 These strategies worked really well and the children play together beautifully. 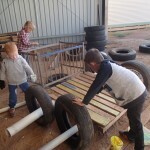 At Pop-up Adventure play the boys used tyres, a pallet and PVC Pipes to make a vehicle. During the day the vehicles role and name changed. It started as an army tank and ended up as a truck as it filled a role in the various games. 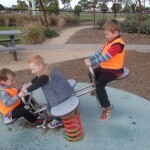 What was very exciting was that this vehicle could move – although it did take a lot of effort! The children soon worked out how many people could be on the vehicle before it wouldn’t move. The friendship between the two Lily’s (Lilly and Lily) was very special. 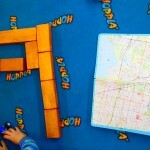 The girls bonded over their shared name and spent all session playing together. 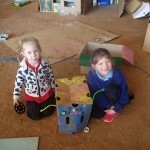 In this photo they made a ladybird from a box. 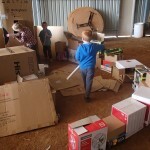 These boys built and amazing fort with a box wall. It was used for a prop in a game of goodies and baddies – complete with PVC pipe guns and shields. 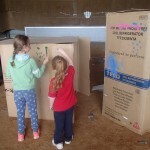 The nature of the game meant the fort was completely destroyed by lunchtime! 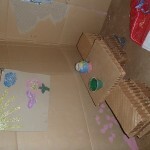 The girls made a house – complete with furniture. Amelia join the game and became their dog. The group packed up really well and it took no time at all. So we had a giant game of Duck, Duck, Goose. Thank you to all our visitors. 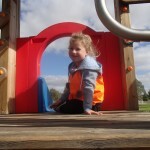 We had a really fun day playing. 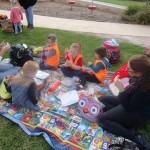 After reading the book :Friendship Bread” by Darien Gee a few years ago – I wondered whether we could use this recipe to enhance our Pre School Community. 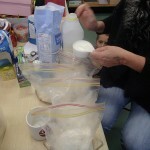 So today we made our starter kit for our ‘Friendship Bread’. The starter kit requires a bit of attention for the next 10 days. Thanks to the families who are taking care of our kits. After 10 days the starter kits will be divided and everyone will be able to take a starter home. 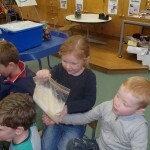 Every family has instructions on what to with the starter kit and how to make the recipe. 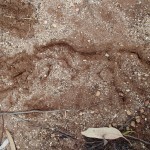 You might also like to take some photos to send in on how it is going. Bring the starter kits back next Tuesday and we will be able to see the progress. I have put the book in the foyer for people to borrow if anyone wants a good read. Happy ‘Friendship Bread’ making. The idea is that we all share something in common. 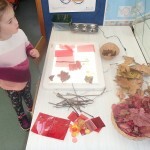 The Autumn weather has set in and we have been collecting Autumn leaves and seed pods at Pre School. 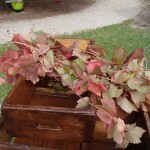 Mrs Jones called in and gave us some beautiful grapevines from the Pub. 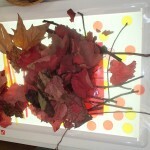 We set up a space at the Light Box for the children to make some Autumn transient art. 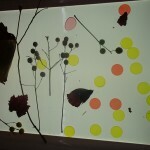 We added some sticks, straws and Autumn coloured plastic disks to the mix. 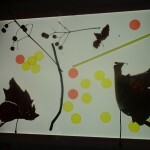 We will use the leaves for some art work in a week or so. 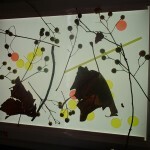 We can see signs of Autumn in the trees around us now. 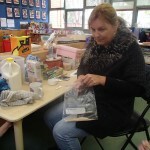 This week Mrs Jones dropped some leaves off that she collected from the Pub and Mrs Grant collected some big ones from the Robinvale Hospital. 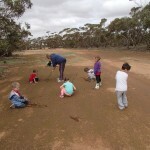 Today we all collected some while we were in Swan Hill. 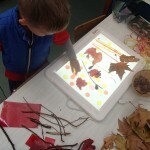 Next week we will learn more about Autumn and have a paly with some leaves. 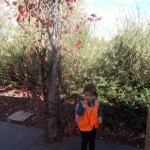 I’m sure there will be lots for us to rake up in the outdoor area too! We have been playing with balls during the past two weeks. 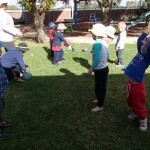 This week the play became more formal as we practices throwing, catching, kicking and rolling in the beautiful Autumn weather. 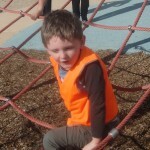 Some of the activities involved us crossing our mid-line which helps our brain development. Crossing the mid-line involves right hand parts of your body going over to the left side and visa versa. For example your right hand touching your left shoulder or sitting back to back and passing a bean bag around (as you see in a photo here). 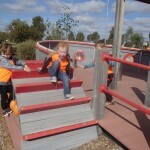 Everytime we bring the children to Swan Hill for an excursion we squeeze in a visit to Tow Hill Park. 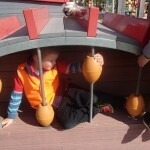 It is an amazing park and we all have a really good time exploring all the elements with our senses here. 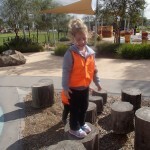 Thank you to the Mum’s who came on the excursion today. You helped it run very smoothly. 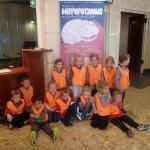 Today we went to see HIPPO HIPPO in Swan Hill. The play was very good. 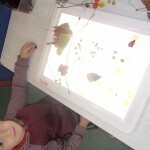 The children really enjoyed the experience and loved the lighting effects. We had read all the stories – so they could predict what was coming next. We talked about ways to express our excitement as an audience before we went. 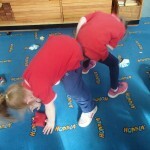 This helped the children know what was expected of them during the performance. They picked up the clapping and laughing cues from the audience. Brock brought some special cars to Pre School for Morning Meeting. 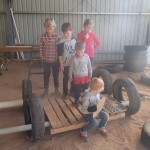 They children all recognised the cars from a show on television. 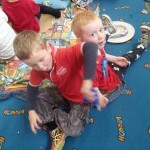 During indoor play the children wanted to play with the cars. 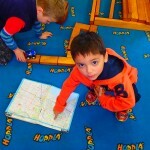 We added some maps (from an old Melways) to the play so the children could use them for inspiration when making their roads. 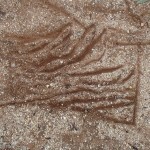 We will need to follow this up with looking at some other features on a map drawing. To add to our doodling experiences we read a story called The Clever Stick by John Lechner. 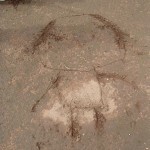 In this story the stick has no voice – but finds his voice by drawing. 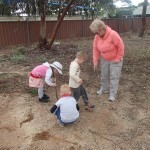 We all found a ‘clever’ stick and had a go at drawing in the damp dirt both at Pre School and Pop-up Play. 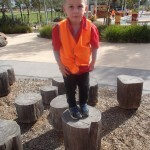 This week our Pre School received a surprise donation from Emmett’s Swan Hill. 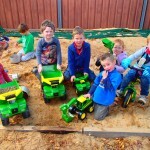 (John Deere Dealers) We got two new large trucks, two diggers, a small truck and a tricycle. 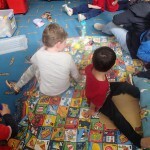 The children were so excited to get these new toys. 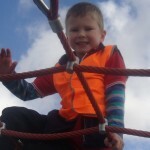 For the teachers and committee – it was lovely to get a donation out of the blue – with no paperwork attached. To the people at Emmett’s we really appreciate you thinking of our Pre School.